Today for #SundaySupper we teamed up with the Beef Checkoff to share with you healthy, flavorful recipes that will make your tongue sing and your belly dance. I am so excited for this recipe because it contains all things I love! Lots of flavor, a little bit of spice and little bit of sweetness, plus it is a breeze to make and low-calorie too! My recipe today is Sweet & Spicy Asian Beef Tacos. Yum!!! I’m just so full of joy with this recipe. The tacos are made with a thinly sliced Top Round Beef that has been marinating in soy sauce, crushed garlic and chili paste. Topped with a sweet and spicy mango salsa on a bed of coleslaw mix. It is an amazing combination of flavors. To keep it healthy I served it in a corn tortilla. Oh man, I think I need a taco now! I wasn’t sure what kind of beef to use, so I checked out the Beef Checkoff website and they have a section called the Interactive Butcher Counter. This is an awesome site for different cuts of beef. They have little green symbol called so I knew what kind of beef I wanted to serve for dinner. I found my Top Round Beef on it and when I clicked the photo, it had the calories and fat count on it. Pretty cool. Then one more click and it showed me a bunch of fun recipes using that cut of meat, plus how to cook it. I love it! So if you’re not sure what kind of beef to serve your family, you should check that out. For the salsa I took fresh mango, and diced it up, added a little bit of red onion and of course I can’t have a taco without jalapenos. Plus, I squeezed a fresh lime on it. Perfect little combination. It’s juicy, sweet, a bit of citrus, plus a pinch of heat. It’s great on these tacos and great for dipping in chips. I made a big batch of it to get me through the weekend. I marinated my meat for about an hour because I was starving and I don’t have the patience to wait any longer. But you could marinate it up to 4 hours if you would like. I cooked my Top Round Steak on the grill for about 5 minutes on each side. Since I got a thin cut of meat, it doesn’t take much time to cook. I actually cooked it perfectly, because it had a little strip of pink right down the middle. I have to admit, I am the grill master in my house. I know my Husband would have over cooked it and made it gray. He claims he likes his beef that way, but I think he’s crazy. To me, the less it’s cooked, the more flavor the beef has. 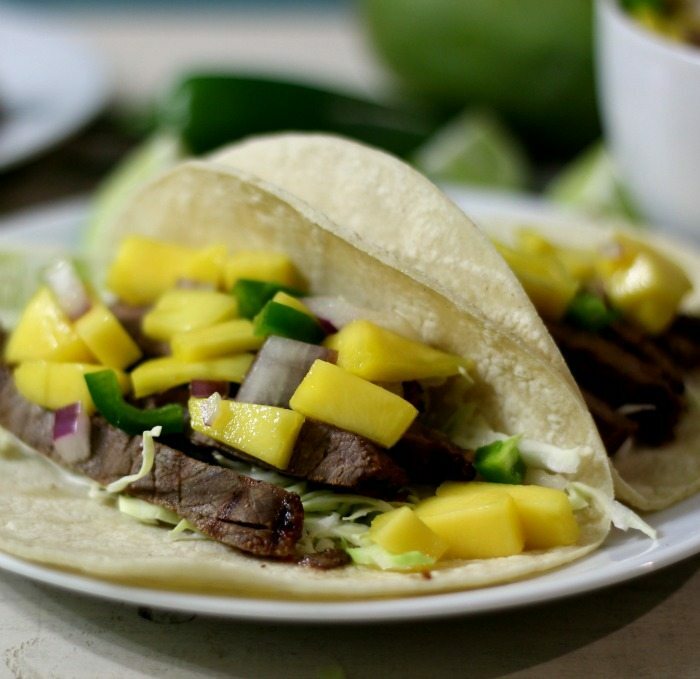 A sweet and spicy taco, made with beef that has been marinating in a Asian sauce and topped with a sweet and spicy mango salsa. In a small bowl, mix together soy sauce, asian chili paste and garlic. Pour over steak and marinate for at least 1 hour up to 4 hours. Heat grill to medium. Throw the marinade out and add the steak to the grill. Cook for about 5 minutes each side. Take off grill and let it rest for 5 minutes. Cut into thin strips. Meanwhile, in a bowl, add mango, onion, jalapeno and lime juice. Mix until well combined. Evenly divide the coleslaw mix over corn tortillas. 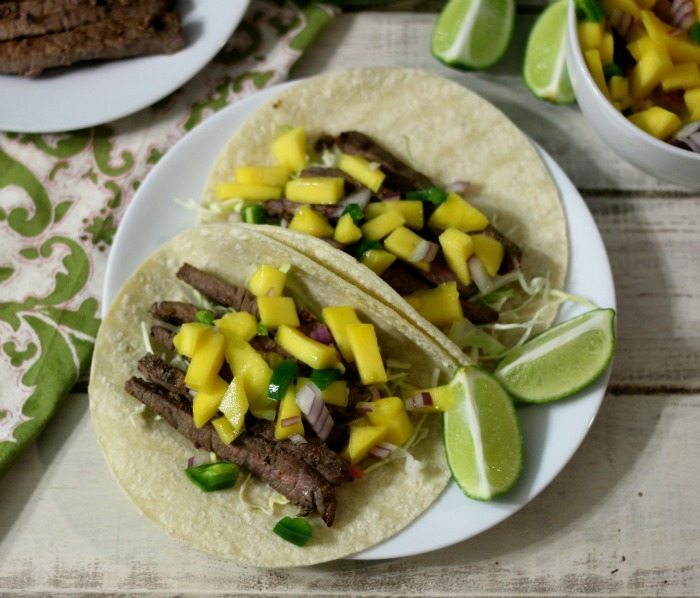 Top with sliced beef and mango salsa. Serve immediately. You can also top with cilantro if desired. Mango salsa can be made in advance. I am just so excited to see today’s #SundaySupper beef recipes. You know how much I love my beef. Plus, to boot the recipes are healthy. You have to check them out below. There are some very unique and creative recipes today. You can also check out the Healthy Meals with Beef Pinterest Board for more great recipes. I hope you have enjoyed today’s recipe as much as I have creating it! I love a sweet heat combo and your tacos sound amazing! Our beef has to be rare, very rare! 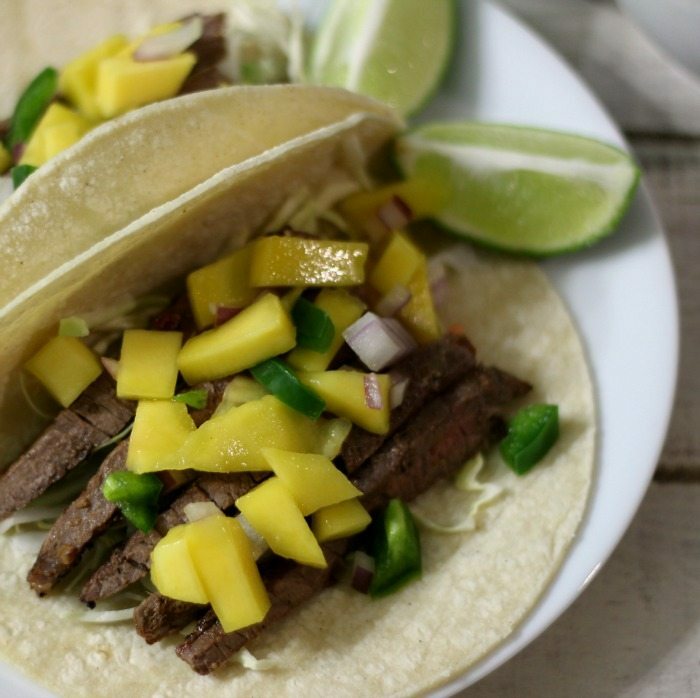 Your tacos look perfect–and I love the delicious addition of mangoes!!! I couldn’t agree with you more. I don’t like over done beef. Oh yum! These tacos with lean beef and mangoes?! Ah-may-zing! 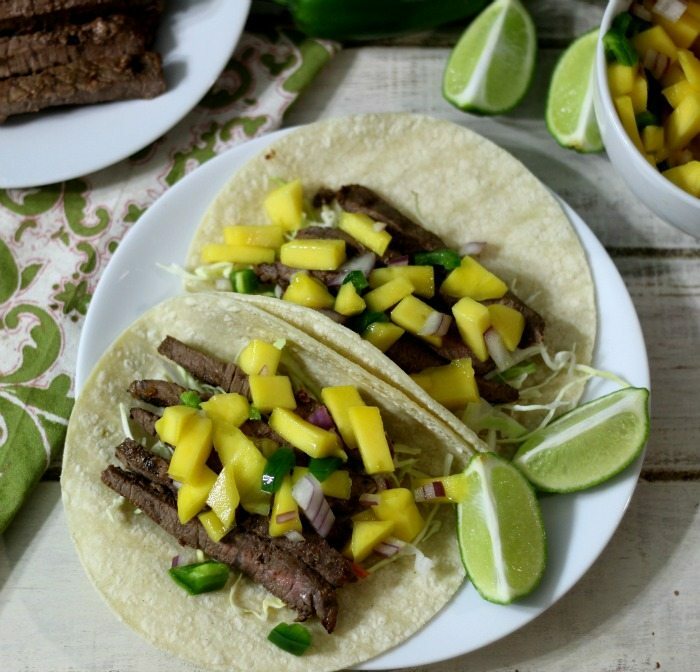 Mango and beef sound like a delicious combo! Thank you Cindy! I love the combo! Love the sweet & savor combination! I too love sweet & savory! One of my favorite combination of flavors. 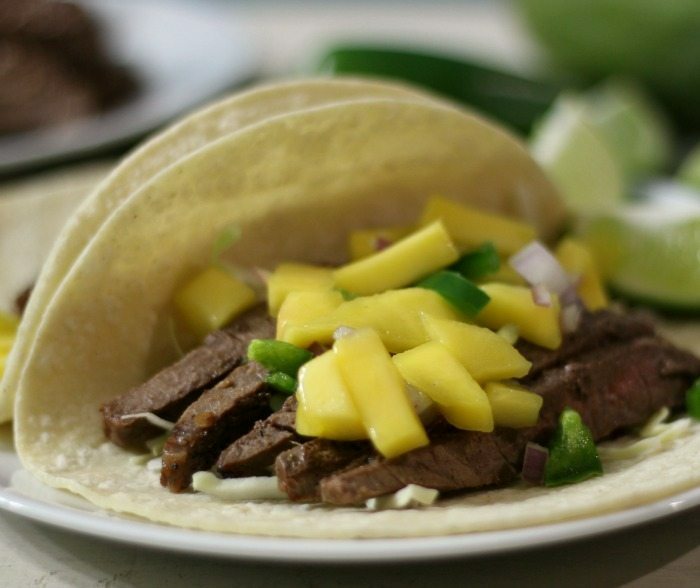 That mango jalapeno mixture on top of the beef sounds so yummy! Thank you, it is! Nice combination of flavors. You’re welcome! Hope you enjoy it as much as we have. Sweet and spicy is such a winning combination! Nice tropical flair to brighten up winter! I love the combination of the Asian sauce with the mangoes and jalapenos. Yum! Very cool idea with the chili paste and soy sauce. I can’t even imagine how delicious these must be! 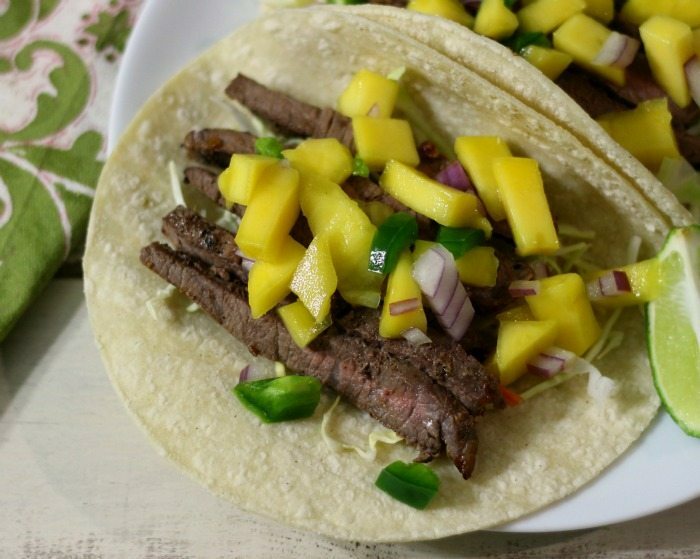 I love the Asian-Mexican fusion and that mango salsa! 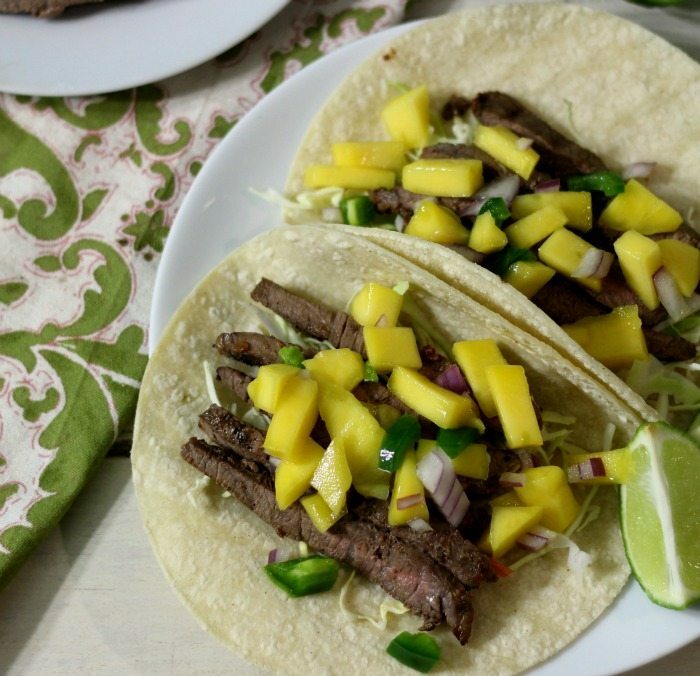 I love Mango Salsa – sweet and spicy is so perfect! The mango lime combination in this looks really interesting to me! Yum! Mmmm I am a taco loving girl and these tacos are definitely worth loving! !